Yuri Is My Job! Vol. 1 Review – AiPT! The cheerful Liebe Girls Academy isn’t all it seems. Kodansha released debut volumes of three new queer manga last week, including Inouesatoh’s 10 Dance and Memeko Arii’s Hitorijime My Hero. The last of the series is Miman’s Yuri Is My Job! It stars Hime Shiraki, a cute and agreeable high school student who finds herself in a bit of a pickle. 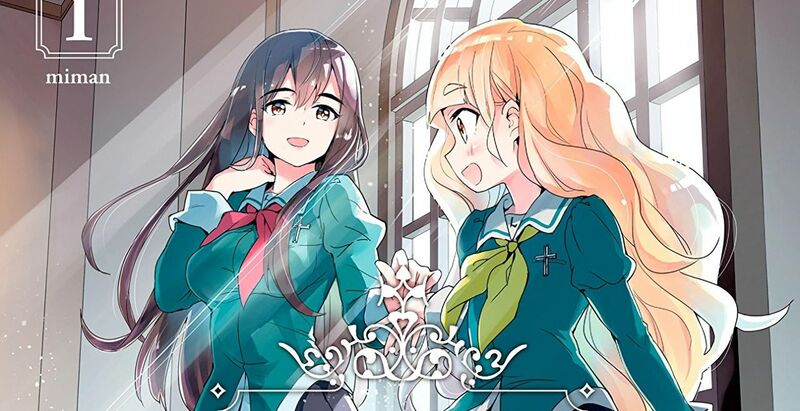 After accidentally injuring the manager of a local theme cafe, the Liebe Girls Academy, she begins working at said cafe to avoid legal consequences. The Academy’s employees all portray high school girls with close, sickeningly sweet friendships. There’s a lot of tension behind the scenes, however, as the employees hide their true selves from each other as well. The series’ debut volume collects its first six chapters, which introduce the core cast and tone of the story. Does Yuri Is My Job! make a good first impression? One of the most unique and cool aspects of this manga is the approach Miman takes with its protagonist. Hime is neither the clear hero or the clear villain of the story. Her motivations and actions can be relatable, sweet, and/or selfish depending on the instance in question. On one hand, she strives to be as sweet and likable as possible so that everyone will like her. With that said, much of her niceness is an act. Her ultimate goal is to be so universally loved that she can find a rich husband with ease. She can’t stand the thought of anyone disliking her or uncovering her real self because then they might reveal the truth behind her facade to other people. Nonetheless, Hime doesn’t seem to wish much ill will on other people, and not all of her kindness is insincere. Rather than push the reader’s opinion definitively in one direction or the other, Miman allows one to approach the character’s nuances on their own terms. This series also impresses artistically, especially where Liebe Girls Academy is concerned. The characters’ frequently remark that it’s like something out of a shojo manga, and the visuals fit that idea perfectly. The pages are chock-full of intricate patterns, lovely shading, and blushing, cheerful young women. This commitment to the shojo aesthetic in the cafe scenes really sells the concept that it’s a totally different place from the rest of the world. It also makes breaks from the facade all the more impactful. When Hime’s disgruntled co-worker, Mitsuki Ayanokouji, scolds her just out of customers’ line of sight, she makes it clear just how fake the entire premise is. There aren’t any glaring flaws to this manga, although some aspects of it are less successful than others. The jokes don’t always land, for instance. The beginning also seems a bit rushed, as if Miman just wanted to get to the meat of the story as quickly as possible. It’s always great not to decompress more than necessary, but as is the opening’s rapid pace feels suspiciously convenient. Once Hime reaches the cafe, however, the pacing evens out. Overall, Yuri Is My Job! Vol. 1 gets the series off to a good start. The main character is nuanced and defies simple moral descriptors, as she’s both sweet and extremely selfish at the same time. The artwork is also well-done and really brings the shojo theme of the cafe to life. There are some pacing issues and occasional jokes that don’t land, but these aren’t particularly disruptive faults. All in all, I’m excited to see where the series goes next. The series gets off to a good start, thanks largely to its nuanced protagonist and total commitment to the shojo aesthetic.